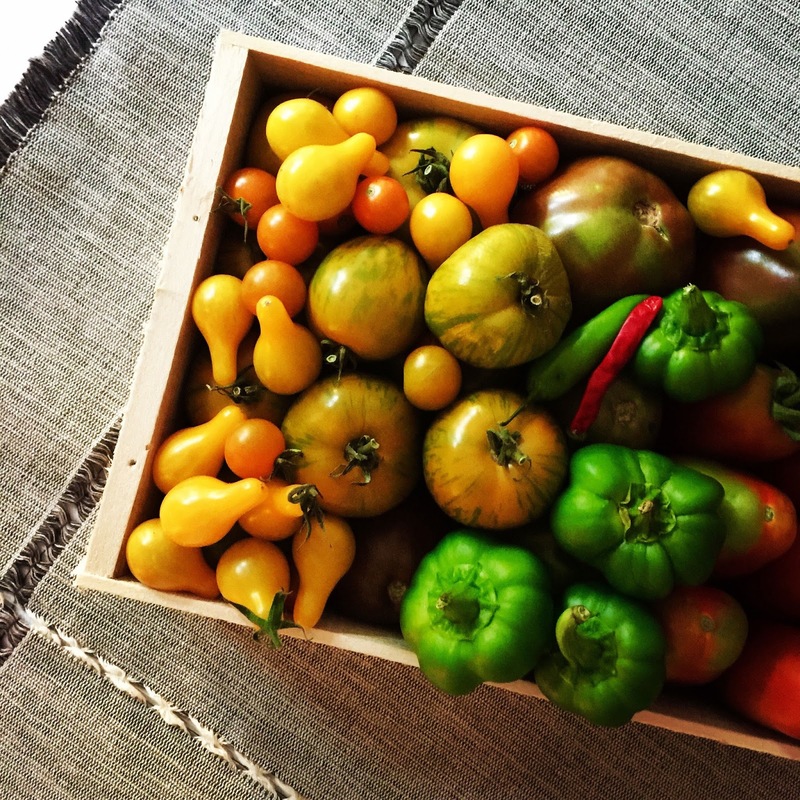 My latest cooking and eating obsession has everything to do with our bumper crop of tomatoes, peppers, and chilies. One particular haul from the garden had me searching for something other than a re-do of salsa, tomato sauce, or stuffed-peppers. Rather than take to the google I pulled down a mix of cookbooks, selecting a few I haven't referred to much. Included in my stack for exploration was "Jamie's Dinners" by Jamie Oliver. On page 29 I found more than I was looking for: a use for our garden goods in a flavorful dish that is so much more than the ingredients that go into it. 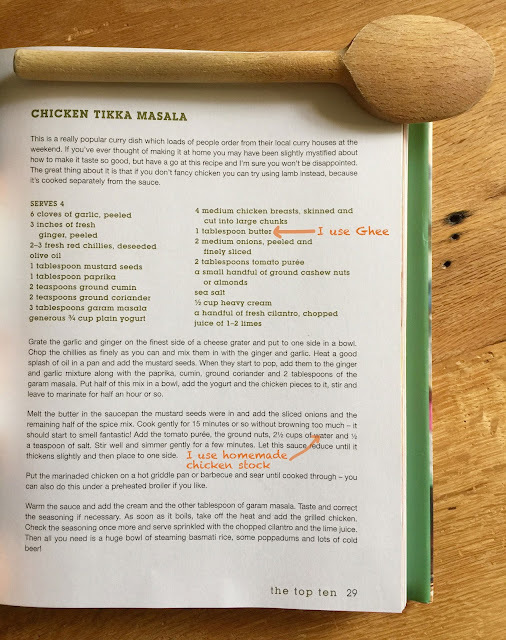 Chicken Tikka Masala brings an exotic mix of smells into the kitchen, something akin to incense. The yogurt marinade cools down the heat from the chilies, and the ground nuts add a luxurious depth of texture, like the nubs in raw silk. I factored in local statler chicken breasts and it all added up to the perfect dish to finish eating with a spoon. The damp, dark morning broke with barely enough light to see the squally bend in the trees. It was as if I'd been transported to Scotland's craggy, mossy seashore .. . the proper setting for the first time I made Scottish oatcakes. My friend, Bob Hower, shared this recipe with me after telling about Scottish oatcakes on The Local Life, a weekly radio show I co-host with Phyllis Fitzgerald. The Local Life is a show about cooking with locally produced ingredients, and about sustainability. We invited Bob to the show because he is an avid farmers market shopper as well as an accomplished cook and maker of pies. His pies are the best I have ever eaten. Yes, it's true. The best ever .. . on to the story of the oatcakes. Scottish oatcakes are a revelation. Bob brought a few oatcakes to The Local Life for us to taste, and I knew I wanted to make them as soon as I bit into one. It gave to the tooth with a snap and a crunch. A comforting, familiar flavor, but in a different form, made rich with just a hint of butter. The salt reminded me of the depth of the ocean. All of that is pulled together in a cracker that is satisfying if unadorned. Made richer with cheese. Or delightful with jam. I texted Bob as I made my simple batch of oatcakes to ask a question about mixing them. We had a back and forth and then he sent me Johnson's Dictionary Of The English Language definition of OATS : A grain that in England is generally used to feed horses, but in Scotland supports the people. Disdainful to say the least. 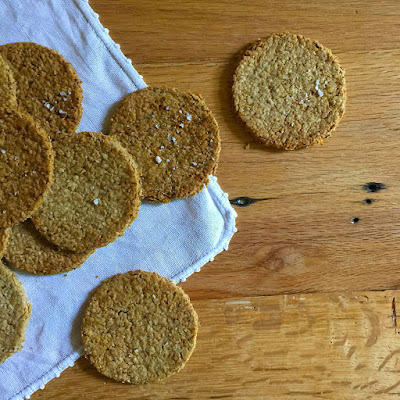 Oatcakes tell the history of Bob's ancestors who he envisions frying them in a pan using lamb fat. 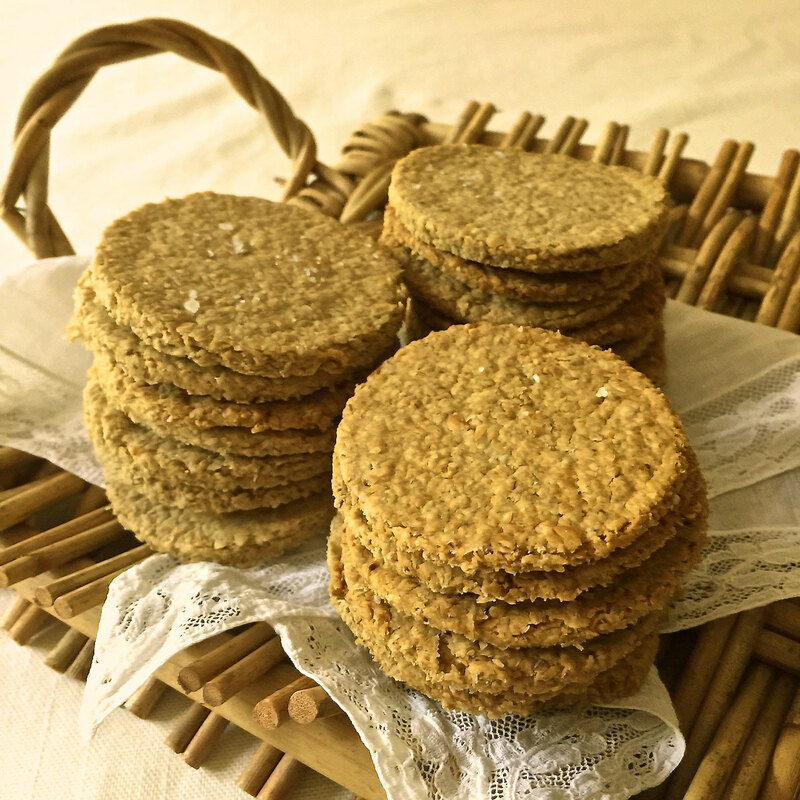 And while it is true that oatcakes are simple, I would not hesitate to serve them to a king and queen if they sat at my table. 1. Put a baking stone into the oven and preheat to 350 degrees. 10. Load the oatcakes onto the heated baking stone and bake for 20 min. then flip them and continue baking for another 20 min. simple isn't plain. simple is straightforward and not fussy. take for example this bowl of hand-cut pasta which is nothing but a few eggs, a little oregano, and flour. 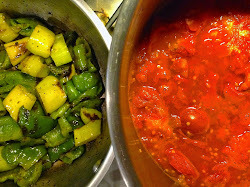 add a sauce made with sauteed red bell peppers that are pureed with a little salt. add a few shaves of a good parmesan cheese. this is a dish that is complete, pure, approachable. 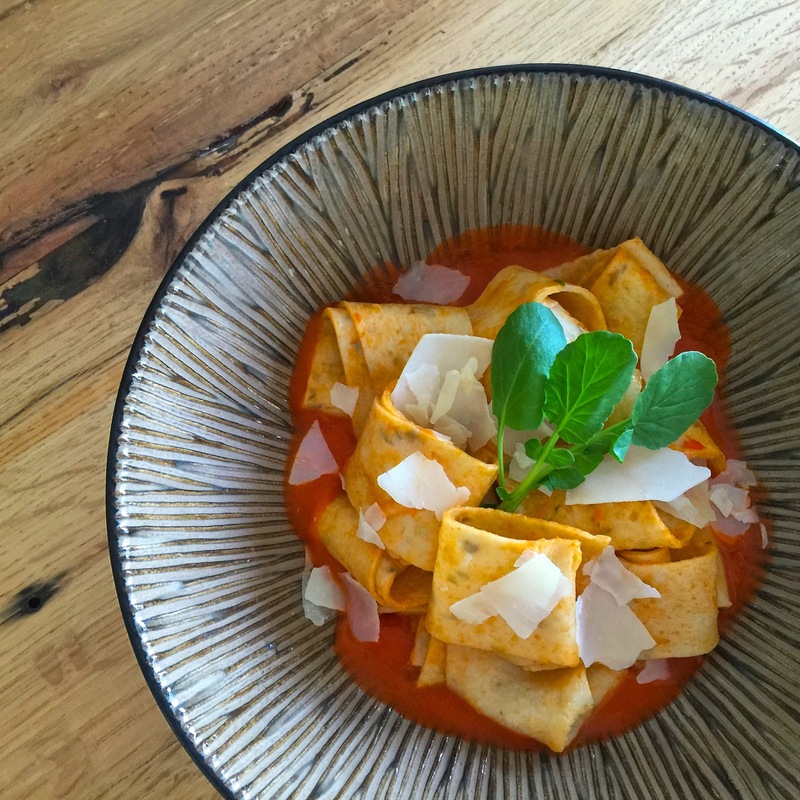 it's uncomplicated, and if you buy fresh pasta it's almost effortless to make. • and cheese. glorious parmesan. 1. bring a large pot of water to a rolling boil. add a big dash of sea salt. 2. boil the pasta just until al dente. 3. save some of the pasta water by straining it over a bowl or removing it with a ladle and then straining the pasta. 4. pour pasta water into a large skillet to measure about an inch deep. heat to a simmer and let it slightly reduce. add the cooked pasta and stir it around. stir in the red pepper sauce a laddle at a time until the noodles are well coated. 5. pour all of it onto a rimmed platter and top with shaved parmesan. each year in september or early october i start testing new-to-me thanksgiving dishes and baked goods– i like to have plenty of time to make adjustments to recipes before the holidays roll in. 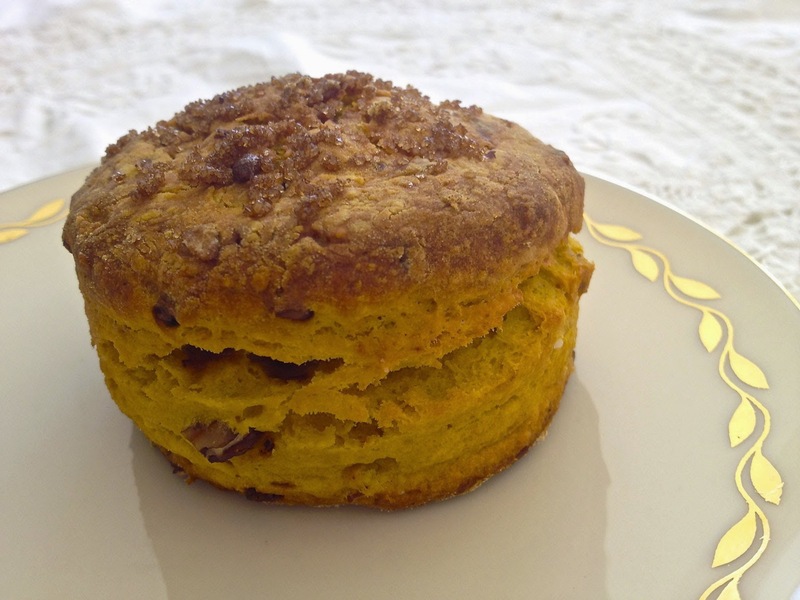 my new fall baking obsession is with these pumpkin, pecan biscuits– seems just right for thanksgiving, right? i've made them four times already because after the 1st round jim asked for more . . . and after that round again his request came for more. and so on. and all ya'll know i can't deny jim any requests from the kitchen. the idea for these biscuits was given to me by my friend-in-food, phyllis fitzgerald (wow, what a baker she is). and about that same time, another friend gave me a golden nugget pumpkin . . . and well, in my kitchen that's more than just a sign they needed to be baked and mastered. these biscuits are not terribly sweet so they are good with ice-cream or bacon–or both. i've served them for dinner with grilled lamb chops, and crumbled over homemade vanilla ice-cream for dessert. they complimented each course equally well. so onward toward thanksgiving . . . and i'm also thinking these biscuits will make a leftover turkey sandwich something special. 1. melt the butter in a 10 inch skillet on med. low. 2. toss in the pecans to coat. add the brown sugar and salt and stir to coat. 4. scatter the nuts on a plate to cool and then break up any clumps with your hands. 1. cut off the stem and cut the pumpkin from the top-down into 4 or 6 pieces. 3. bake at 375 degrees for about 45 min. until the flesh is easily pierced with t fork. 1. stir together the dry ingredients in a large bowl. 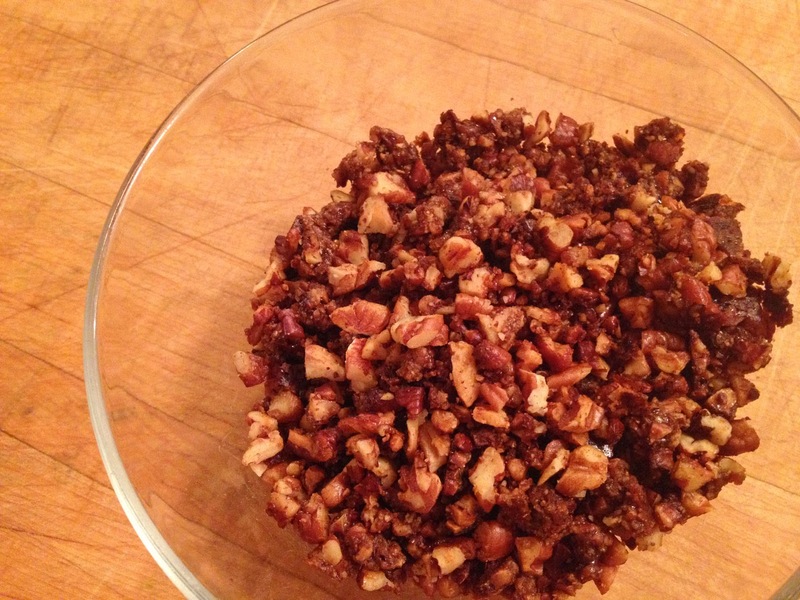 2. add the candied pecans and stir to combine. 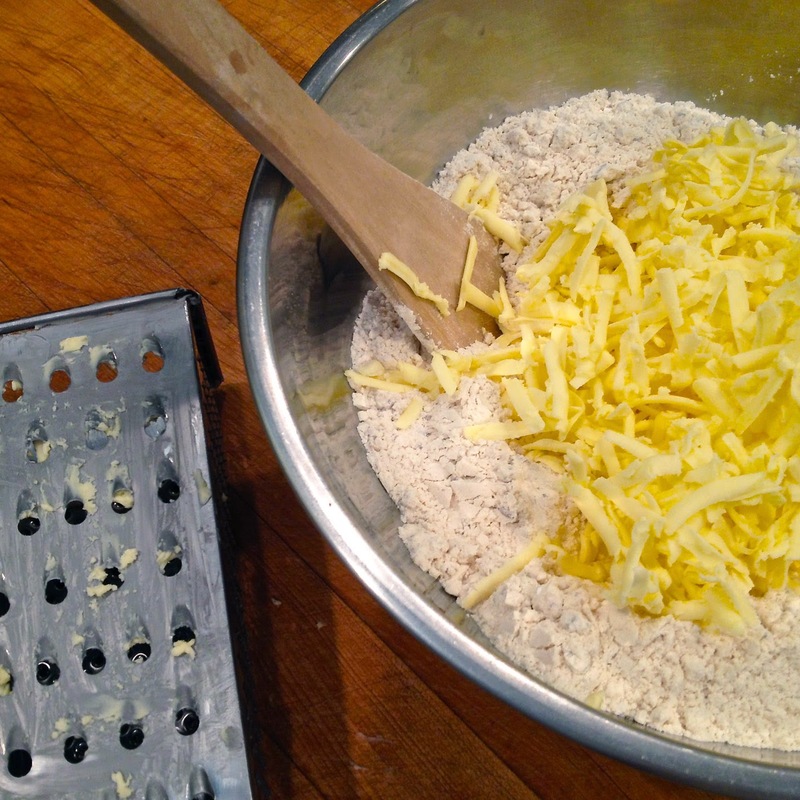 2. shred the butter on the large side of a grater into the bowl. 3. combine with your hands just to spread the butter throughout the flour. 4. mix in 2 cups of the purée to form a wet, sticky dough. add more purée if needed to form a shaggy dough. 5. turn the dough out onto a lightly floured counter. lightly dust the top of the dough and press into a rectangle about 3/4 inch thick. 6. to laminate the dough: cut the pressed dough into 4 pieces and stack them. 7. press out again to 3/4 inch thick and cut with a 3" round dough cutter. 8. set the cut biscuits onto a lightly dusted cookie sheet. 9. reform and press and cut the remainder of the dough. 11. carefully put the biscuits on the baking stone and set the timer to 15min. check for doneness and bake a few min. more if needed. this recipe from chef hugh acheson, vaulted off the page when i thumbed through an issue of food and wine . 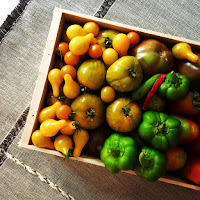 . . the colors, the flavor combinations, the fact that on my counter sat a bowl of the three main ingredients– just hauled in from a few local farms. and, out in my kitchen garden are basil plants with full canopies of their signature fragrant, arching leaves. 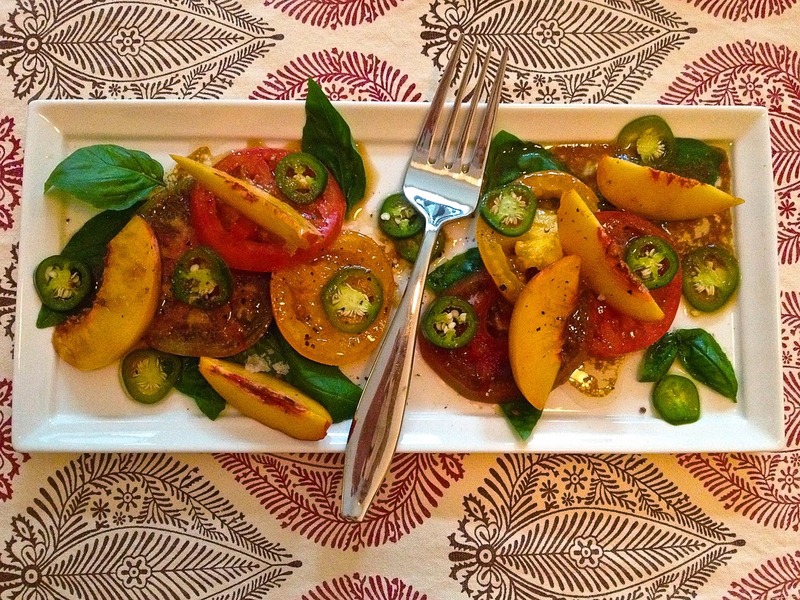 headliners of this salad are the tomatoes and peaches that ring out loud with acidic and sweet notes. second fiddle is carried by the jalapeños which add a conspicuous element of hotness that is quickly tamed by a pickling brine. the dressing is a synthesis of salt, citrus, piquancy, and smoothness from the avocado oil. 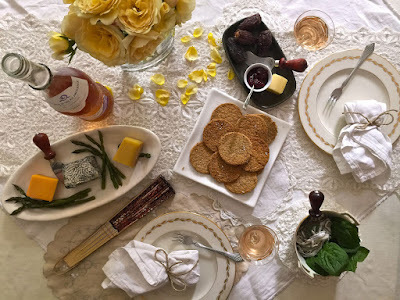 the heady perfume of basil ends each bite with anise notes. in total, this dish is one of the best things i've eaten all summer . . . worth setting my spoon down to fork it over. adapted recipe from chef hugh acheson. but remember, i don't actually measure–i taste and adjust to my own liking. in a small saucepan, bring the water to a boil with the vinegar, honey and salt, stirring to dissolve the honey. remove the pan from the heat. add the jalapeños to the brine, and let them stand until cooled to room temperature. meanwhile, in a small bowl, whisk the soy sauce, lime juice, ginger, mustard and the avocado oil. taste to adjust for balance. 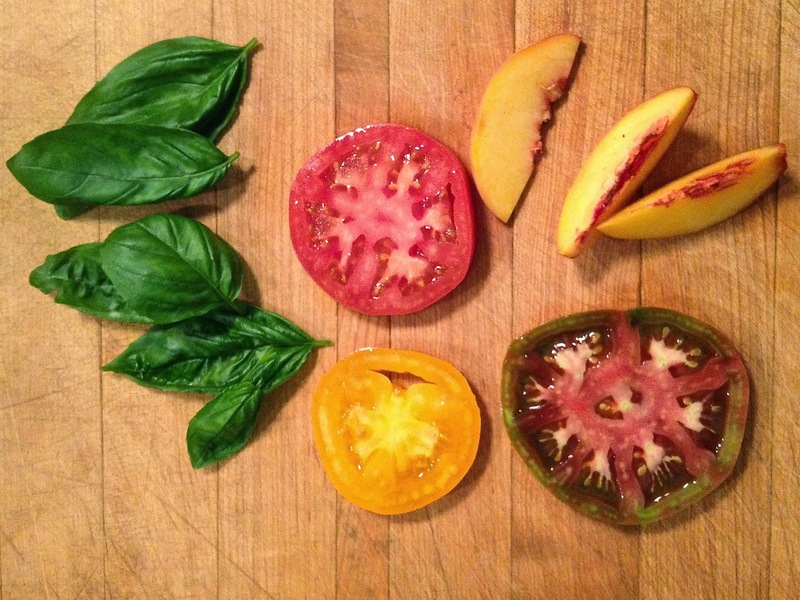 arrange the basil leaves, tomato slices, and peaches on a platter. remove the jalapeños from the brine with a slotted spoon, and add to the platter. drizzle the salad with the soy-lime dressing.